Your blood sugar swings (peaks and troughs) and your hyperglycaemia (higher blood sugar) will be damaging your brain! That’s why Alzheimer’s disease is called Diabetes type 3! Lynn, don’t worry, I took the hypoglycemia very seriously! I worked aggressively to stabilize it and it finally normalized. Hi John, mine stabilized on its own after months. The typical recommendation for managing hypoglycemia is to eat small, frequent meals. That usually does the trick. I ate eight meals a day for about a month, but had to stop because I couldn’t deal with having eight migraine attacks every day. Did you finally stabilize your blood sugar on the 4:1 diet? I’m now 3 weeks into a keto diet and whenever I become hypoglycemic proteins makes me sick. The only thing that reliably helps is straight butter. I am looking for more solutions to enhance ketone creation as this seems to be what my body is reluctant to do-at least it doesn’t create them at the level required. Hi Melanie, yes, it stabilized after a few months. I was able to eat every two hours for a while, which helped a lot. I found a glucose monitor to be helpful, too. It kept me from letting my blood sugar drop dangerously low. 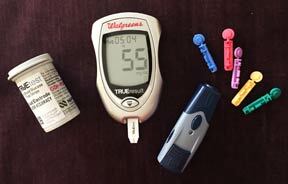 Glucose monitors are relatively inexpensive though the test strips are pricey. If you’re not familiar with MCT oil, you may want to look into it. It won’t help with hypoglycemia, but is thought to increase ketone levels. Did you find a solution? My BG is down to 46 after a meal. I also get sick with protein. Should I raise low blood sugar with carrots or broccoli? or stick it out with straight butter (this is what I would WANT to eat, but fear that will not be enough when BG is so low). Will it bounce back naturally if I only feed myself fat when that is happening? I probably just spiked myself and am keeping myself out of ketosis even longer..? People. GLYCERIN for hypoglycemia symptoms. 1 tbsp in water. Immediate symptom relief. Zero effect on insulin or blood glucose. Miracle. Research Glycerin/hypoglycemia. That is all. Annie, glycerin is great unless you’re on an extremely low carbohydrate diet. This post is about when I had trouble with hypoglycemia on a medical ketogenic diet. I was limited to 15 grams of carbohydrates a day (for reference, a small apple has about 21 g). Using glycerin would have drastically reduced the already minuscule amount of vegetables and fruit I was able to eat. So glad you found a solution! Were/are you diabetic or did you ever have evidence of actually having periods of high blood sugar? I am not necessarily on keto but am having what I’m almost positive hypoglycemic episodes when I have the one two whammy of low carb and low sleep, and in the past migraines as well. I just started checking my sugars, my fasting is great as it was last time my Dr checked (low 80s) but today I ate a fairly high carb lunch (quinoa with a little fruit and veg making up carbs) and I felt fine but my level was 77 a little over 2 hours later which seems low for having had a higher carb lunch :-/ so I’m really curious to see what it is during an episode.. I have a feeling pretty low. I can never stomach the thought of drinking juice or anything plus as you mentioned you are trying to go low carb so that is beyond counterproductive 🙂 thanks for any insight. Kerrir, how did everything work out? Are you still doing half protein? Which ratios ended up working best for you? I am thinking of lowering protein and upping fat to 85% fat. 5% carbs. Eat butter in between? My sugars have been so low. Ive broken out with cystic acne and am dehydrated. How do I get my sugar back up from 46 safely? ?